TICKET GIVEAWAY NOW CLOSED. Thanks everybody for the interest! 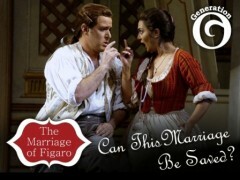 We have five free tickets to Thursday’s performance of The Marriage of Figaro to giveaway! Washington National Opera’s Domingo-Cafritz Young Artists are featured in this one-night-only event May 6 at 7:30pm at the Kennedy Center’s Opera House. Part of Generation O, the Opera’s young professionals group aimed at patrons aged 18 to 35, it’s a great opportunity to enjoy Mozart’s opera frolicking through the battle of both the sexes and the classes – revolutionary in its day and still a riot. Respond below if you’d like to go and we’ll set you up with the WNO. I’d like to go! 2 please! love to take my girlfriend to the opera! Did someone say Mozart opera? Oh yes, please! And that’s a rap, dear readers! Please look out for an email from me and the WNO with info on your tickets. Thanks! My mad for opera friend is visiting. would love to take her to the show. I would love to take my boyfriend to see our first opera! I would love to go! Can I have two tickets please? I would love to go! Le me warm up myvocal chords for you. Figaro, Figaro, Fiiiiggaaarrrooo! I’d love to go! 1 or 2 tickets, please. Wow, I’ve never been to an Opera. This would be amazing! Never been and would love to go! !